This combination of two file photos shows Turkey's President Erdoğan and Treasury and Finance Minister Berat Albayrak while meeting their France and German counterparts. Turkey’s diplomatic offensive against the sanctions imposed by the United States continued on Aug. 16 as it was engaged in more high level talks with Germany and France. President Recep Tayyip Erdoğan and French President Emmanuelle Macron have agreed to improve bilateral economic and trade ties as the Turkish economy is passing through a dire strait after the United States imposed sanctions on its NATO ally due to the detention of U.S. pastor Andrew Brunson. Erdoğan and Macron spoke on the phone on Aug. 16, a day after the former had a similar conversation with German Chancellor Angela Merkel. Erdoğan’s diplomatic campaign follows after the Turkish Lira has been seriously hit due to ongoing spat with the U.S. According to a presidential source, Erdoğan and Macron emphasized the importance of improving bilateral investment and economic and trade relations. The same source stressed that Macron told Erdoğan Turkey’s economic stability was also important for France. The two leaders also agreed on further talks between the economy and treasury ministers of both sides in a bid to seek ways to improve investment and trade opportunities. Two European heavyweights, Germany and France, are among top foreign investors in Turkey, who have thousands of companies operating in Turkey for decades. The two presidents have also exchanged views on recent developments in Syria, particularly in the Idlib province, with concerns that the Syrian regime would launch a massive military operation into the enclave at the expense of creating a new refugee influx towards Turkey and of causing civilian casualties. Turkey will host a summit in Istanbul on Sept. 7 with the participation of the French president, German Chancellor Merkel and Russian President Vladimir Putin on Syria and other regional issues. 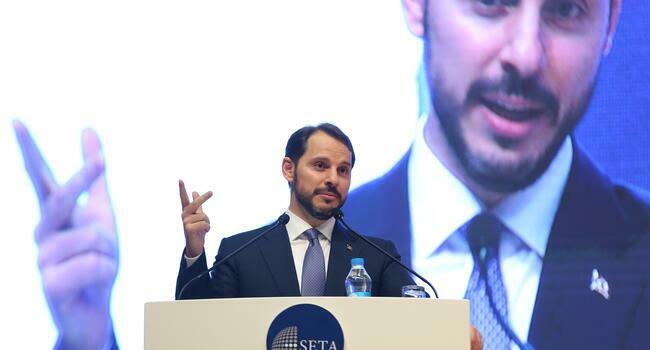 Turkey’s Treasury and Finance Minister Berat Albayrak, on the other hand, held a phone conversation with his German counterpart Olaf Scholz on Aug. 16. Scholz stressed the importance of a strong Turkish economy for both Germany and the EU, while Albayrak voiced his satisfaction for German statements that supported Ankara in the ongoing row, the statement said. The two ministers agreed to meet in Berlin on Sept. 21 to “take steps to further enhance economic cooperation” between Turkey and Germany, it added.